This is a fun and easy project to make with your kids. Even if you’re already in possession of several challah covers (including the ones brought home from pre-school and/or hebrew school), it’s always fun to mix it up - why not add this one to the rotation? You can download this tutorial as well as the templates here. 1. Remove strands from each side of burlap until you have your desired fringe length. 2. Apply thin line of glue at base of fringe around entire perimeter (to prevent fraying). Allow glue to dry. 3. Cut out paper pattern pieces and lay them out to fit on blue felt. 4. Trace around each pattern with white chalk and cut out shapes. 5. Position felt shapes on burlap using challah cover picture as guide. 6. Apply glue around perimeter of backside of each shape and press onto burlap. Glue should soak through to the backside of the burlap for best adhesion. Allow glue to dry. 7. Wasn’t that easy? Now you just need a challah to cover… Consider making extra to give as Chanukah gifts! Easy to print 8.5”x11” templates (above). For those interested in taking this project a step further, you can add detail to the design using a needle and thread as shown below. Download this version of the tutorial here. This is a watercolor painting that I’m thinking about turning into a challah cover design on Spoonflower. Nothing symbolic going on here, just wanted a joyful, natural feeling. 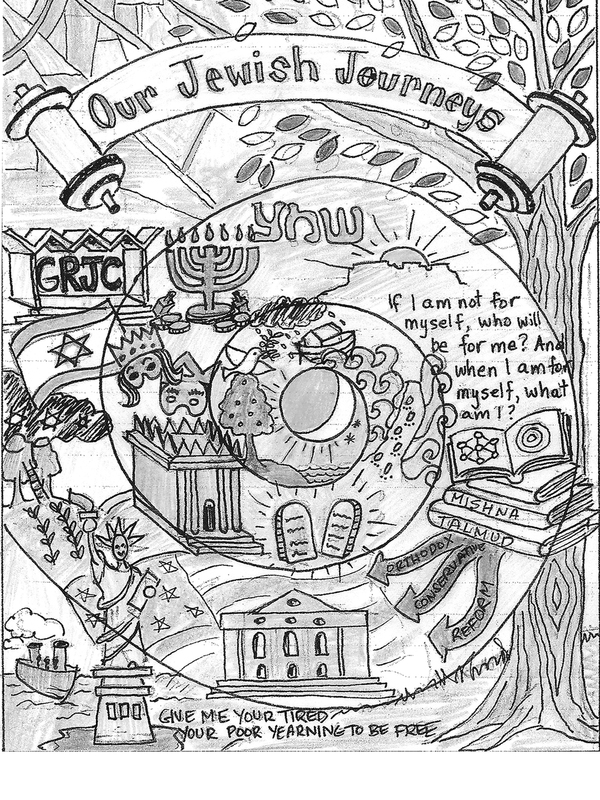 This illustration was published years back in the Baltimore Jewish Times to accompany an article entitled "High Holiday Youth Services". I didn't have children of my own at the time, but now that I do, I realize that my portrayal of youth services was not quite accurate - these kids look absorbed, attentive, happy to be there - quite the opposite of how most kids appear under similar circumstances. I myself have always had a hard time sitting for three hours through high holiday services (let alone my kids and especially my husband). This is why as a family we've only attended two or three of these services in the past 15 years. Unlike most jews affiliated with a synagogue who tend to flock towards the synagogue during high holidays, we prefer to stay away from the crowds in favor of some family time and a hike in the woods. We're more likely to sit through services on an uneventful Saturday morning, if at all! However you choose to celebrate the New Year, I wish you and your families a Chag Sameach! 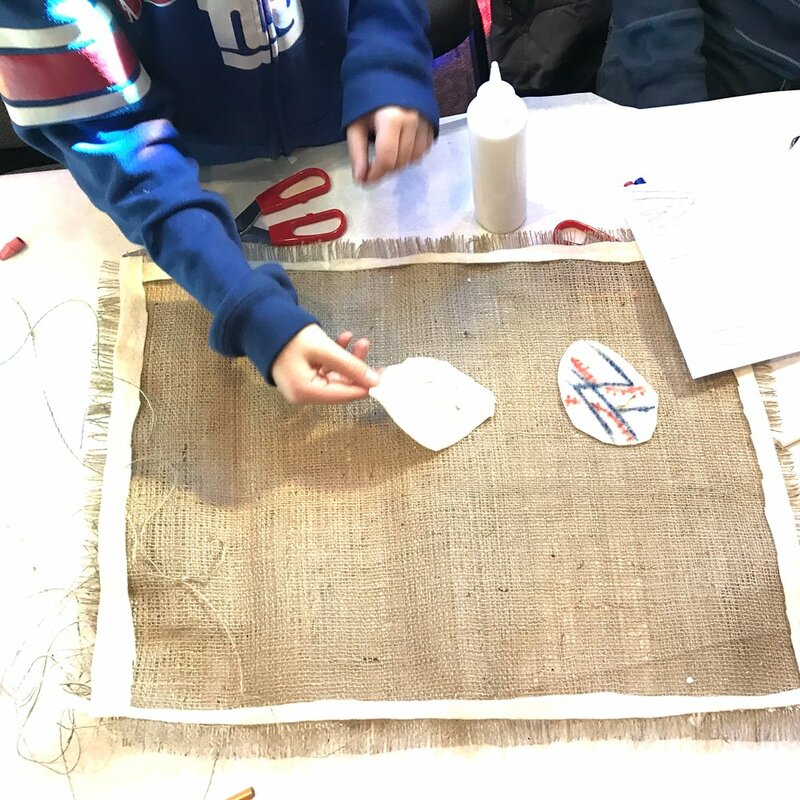 To make these challah covers we used burlap, white felt, colored chalk, scissors and glue. I cut the burlap ahead of time. Workshop participants removed strands along the perimeter to make a fringe as long or as short as desired. A line of glue stopped it from fraying any more. Designs were sketched onto the white felt, cut out, and glued into place. Colored chalk remnants blown away. Done! Easy, inexpensive, rustic, unique. My daughter and I made the ones below and alternate with others we’ve made to make each Shabbat meal special…. I have three kids, ages 10-15, and they all went to Jewish pre-school. Back then, when December rolled around, it was all about Hanukkah. Songs, food, crafts and dreidel - all good. When they entered kindergarten in public school, however, they were one of a small handful of Jewish kids in the classroom. So when December rolled around, they experienced all their classmates' excitement about Christmas, along with some puzzled looks about Hanukkah. This produced a bit of Santa envy. That's when I e-mailed the teacher and asked if I could come in to teach the kids to play dreidel. I've done this every year for each child until they were out of elementary school (my youngest is in 4th so I only have two years left!). Every time I asked, the teacher was happy to give me at least a half hour of class time. This post is for anybody who'd like to start this hanukkah tradition for their kids. I put together this little guide to make it easy for you. My kids have always looked forward to my coming in to teach dreidel, and after experiencing it once, so did their classmates! - Schedule with teacher in advance - a 30 minute time slot is ideal. - I like to start off by telling the story of Hanukkah. The website My Jewish Learning has one that's an ideal length called "What You Need to Know About the Hanukkah Story". You can find it here. • DREIDELS: I bought a 30 pack of wooden ones here. • DIXIE CUP: I like to count out the beans in advance, and a little cup is a handy way to store them and hand them out to the kids. • BEANS: I use dried black or kidney beans. • PRINT OUT: (See below) Kids can refer to this as they play. Here's one I made up that has 3 per page, so you just need to print it out and cut into thirds. Download it here. - Bag of gelt (optional). Because of allergies, your school might not want you to hand out food (my daughter's school doesn't). In this case, what I do is leave the bags of gelt in a box on my front porch. In class, I give the kids my address and let them know that if they'd like a bag of gelt they can ask their mom or dad to drive past my house and pick one up. I found a box of 24 that specify NO NUTS here. Dreidel is a traditional game of chance, and one of the most well-known symbols of Hanukkah. The dreidel is a four-sided top with a different Hebrew letter on each side. The game dates back at least to the time when the Greek King Antiochus IV (175 BCE) had outlawed Jewish worship. Jews who gathered to study the Torah would play dreidel to fool soldiers into thinking they were just gambling. Now, it's usually played to see who can win the most gelt (chocolate coins wrapped in gold foil). With a dreidel and some tokens, you can take part in this holiday tradition, too. Gather friends. You can play with as few as two, but the more the merrier! Distribute tokens evenly among all of the players. The tokens can be any little thing: pennies, nuts, raisins, matchsticks, etc. A lot of people use gelt. Ante up. Before each spin, players put one token in the middle of the circle to create "the pot." Every time the pot is emptied, or there's only one token left, every player should put a token in the pot. Shin ("shtel" or "put in" in Yiddish) - Put one more token in the pot. Nun ("nisht"or "nothing" (in Yiddish) - Do nothing. Gimmel ("gantz"or "everything" in Yiddish) - Take all tokens from the pot. Hay ("halb"or "half" in Yiddish) - Take half of all tokens lying in the pot. In case of an odd number of tokens, round up. If you run out of tokens, you are either "out," or you may ask another player for a loan. Pass the dreidel on to the next player. Keep playing until someone wins by collecting all the tokens. Lastly, if you'd like to hand out a dreidel coloring sheet for the kids to take home, here's one I made last year - you can download it here. Good luck - have fun - and Happy Hanukkah!!! My latest challah cover design is inspired by an artwork I saw in a book entitled "Traditional Jewish Papercuts" by Joseph and Yehudit Shadur. It's a beautiful book, with highly informative text and descriptions. The papercut my illustration is based off of was a type of amulet called a "childbed letter". It was originally meant to hang on the nursery wall to thwart "the evil intents of the witch Lilith who carries off newborn infants"... Where there were areas of text on the papercut, I substituted a sun, and in the rectangular shape flanked by lions, I inserted the word "Shabbat" in Hebrew. Below you can see that I've experimented with three color combinations: red and yellow, purple and orange (with purple ball fringe), and the traditional blue and white. Do you have a preference? This will have been my third art session in my new job as art teacher at the Glen Rock Jewish Center hebrew school. For the first lesson I made the obvious choice in teaching about Marc Chagall. The second lesson was around the time of Passover, so we learned about illuminated manuscripts with a focus on the haggadah. For the third lesson (and the last one of the school year since I began mid-year), I chose to focus on the artist Leonard Baskin. I've always liked his work and in addition, since I like to introduce new techniques, I liked the fact that he's primarily known for his woodcuts. Since I myself am a printmaker, it was great to be able to bring in my own carved woodblocks, prints and tools to pass around. Although the kids were slightly disappointed when they realized they'd be "carving" foam rather than wood, they still seemed to love the lesson, and the results. 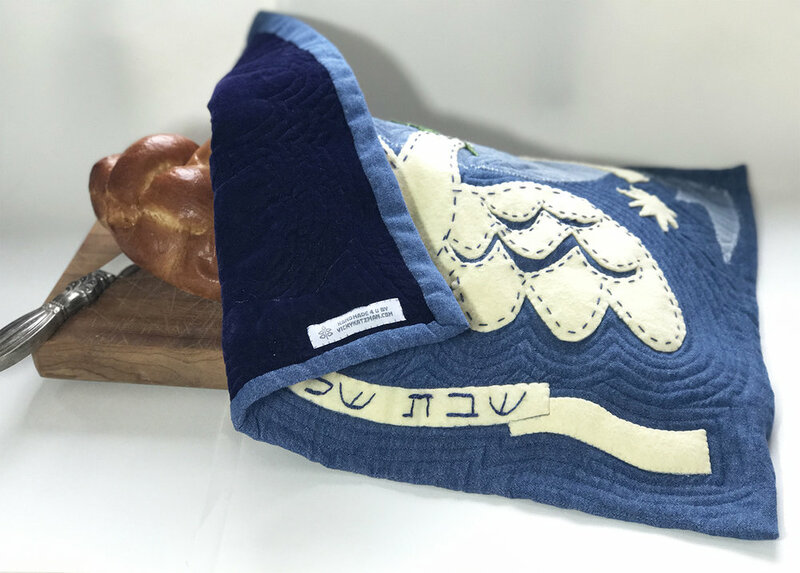 The first has a felt dove appliquéd onto a denim background with hand embroidered text that reads "Shabbat Shalom" both in English and in Hebrew. The backside is a dark blue velvet. It's machine quilted with echo lines. The second is made with denim, twill, chambray, quilting cotton and muslin. It's also hand embroidered with "Shabbat Shalom", but only in English. The backside is an off-white cotton, and there's no batting or quilting, so it's thinner than the previous cover. The third challah cover is quilted like the first, and has a patchwork design like the second, but is unique in that it's made with some of my hand-stamped fabrics. There's denim, twill and cotton fabrics with a white twill backside. Next up will most likely be needle felting.... stay tuned! Today is the first day of Sukkot, one of my favorite Jewish holidays. It's sort of like Thanksgiving in that it celebrates the earth's bounty, but it's also a commemoration of the 40 year period the Jewish people spent wandering in the desert after escaping their lives of slavery in Egypt. The Hebrew word sukkot is the plural of sukkah, which means "booth" or "tabernacle". The sukkah is a temporary structure with four walls and a roof loosely covered with branches so that the stars are still visible. During the harvest season, farmers would build and live in these structures out in the fields, and during their exodus from Egypt, Jews would live in dwellings such as these. For several years, I used to build a sukkah of our own in the backyard. My family and I would eat our meals inside, and one year we even slept in it overnight. I stopped building it in recent years because it was a HUGE job, but for the years we did have it, it was a wonderful experience. Besides the sukkah structure itself, the holiday includes a ritual which involves shaking the lulav and etrog in all directions (signifying that G-d is everywhere). The etrog is a citrus fruit similar to a lemon, and the lulav is three different plant species all bound together, and named for the largest of the three. Combined, the lulav and etrog are four species, all of which are mentioned in the Torah. There are several explanations as to why these particular species were chosen for the ritual, but my favorite one likens each of the species to a part of the human body. With the etrog as the heart, the willow as the lips, the lulav (or palm) as the spine, and the myrtle as the eyes, it's said that through the use of these body parts we can serve G-d by helping others. I don't have a sukkah this year, but if I did, I might use my illustration shown here as one of the decorations. If you'd like to download this image to hang in your sukkah, feel free, you can get it here. Hang as is, or color it in. One suggestion that I have is to laminate it with one of the thicker weight lamination films at your local copy store. This will protect it in the rain, keep it hanging flat, and give you a stiff border through which you can punch some holes to hang it. If you remember, please send me a pic of your sukkah, would love to see it. Chag Sameach! When I was growing up, my family and I celebrated Shabbat almost every week. My memories of the sights, sounds, smells and tastes of our Friday night dinners together have always stayed with me. I remember the roasted chicken and steaming veges waiting on the stovetop while we welcomed in Shabbat. My mom's high singing voice blessing the candles, my dad's serious voice reciting the Kiddush (the blessing over the wine), the warm glow of the flames, the sweet syrupy sips of Manishevitz. The challah would sit patiently under cover while the candles and wine got their turn. You would think it was hidden to stop kids like myself from grabbing at it, or to keep it moist, but I was told it was “to spare it’s feelings about being last to be blessed”. Maybe that’s why each of these ritual objects seemed to have a life of their own. Not only did they play an important role at Shabbat dinner, they had feelings that could be hurt! After taking the cover off of the challah, either me or one of my sisters would sing the Motzei (the blessing over the challah). Dad would cut thick slices (but then halve them), lightly salt and then pass them around the table till we all had a chunk of our own. Mmmmm. 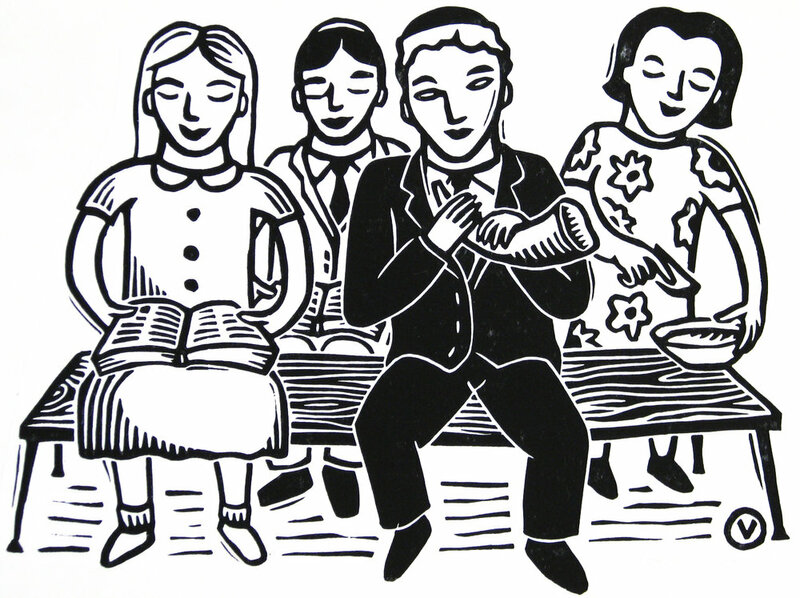 If we had finished eating our dinner we could be excused from the table, and were called back again for benching (the blessing after the meal). As I sung along, I liked to run my finger really fast through the candle flames and marvel at how I didn’t get burned. We’d finish with an energetic, table thumping version of “Shabbat”, a song with only three words: shabbat, shalom and hey! Friday night dinners made Shabbat into something to look forward to. The rituals (and short explanations) were enough for me to feel the specialness of Shabbat. But when I went off to college, I'd only spend the occasional Friday evening at Hillel, and when I lived in NYC during my 20's and 30's, I barely thought twice about celebrating Shabbat. It was when I had my own kids, however, that my memories of celebrating Shabbat with my family resurfaced, and made me want to share the same wonderful experience with them. Today, roasted chicken and steaming veges wait on the stove while I (or one of my children) light the candles. My family and I celebrate Shabbat just as I did when I was growing up. 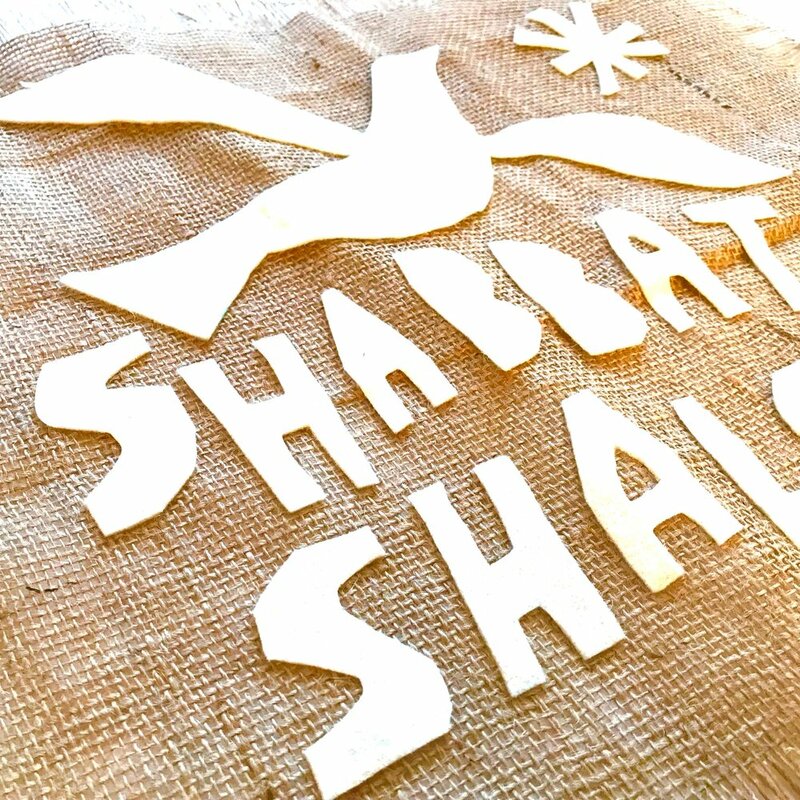 When my kids have grown and leave home for college, they may or may not attend Hillel, and in their post-college years they may or may not even think about Shabbat. But it's my hope that their memories of our Friday night dinners together will stay with them always, and perhaps resurface as they did for me, making them want to celebrate Shabbat with their own kids. This quick tutorial accompanies the Peace, Love, Chanukah cut & sew I designed for the Spoonflower holiday gift bag contest. 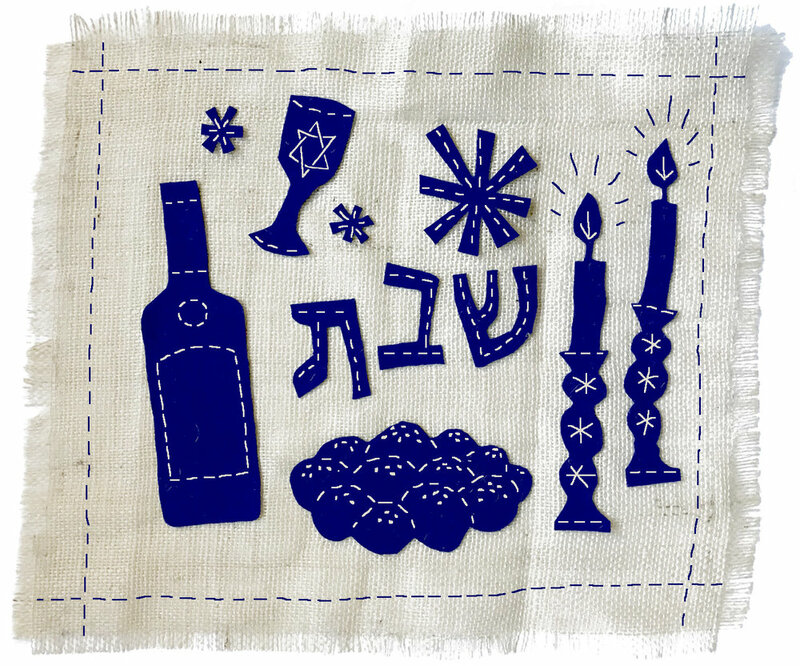 I used my cut-paper design which I originally used as a Chanukah card illustration. Enjoy! Peace, Love, Chanukah cut & sew pattern. 1. Cut out the pattern pieces along the dotted lines. 2. Place right sides together. From top of design, measure down 1" and place pins at the 1" mark on both sides. Continue pinning along the side and bottom edges. 3. Starting at the 1" mark, backstitch then continue to sew around the perimeter using a 1/4" seam allowance until reaching the 1" mark on the other side. Backstitch to secure. 4. Trim tips of the bottom corners at an angle. 5. Press seam allowances open. 6. Turn the unfinished top edge under 1/4", iron and sew. 7. Turn top edge under again, this time 3/4", iron and pin. Starting at a side seam, sew around the top of the bag, keeping seam 1/8" from bottom edge of fold. Backstitch at the start and the finish. 8. Turn bag right sides out and iron seams flat. 9. Measure anywhere from 20" - 40" of ribbon or string depending on how long you'd like the finished handle to be. Pin the safety pin through one end of the ribbon, then thread safety pin through and around top seam of bag. Pull ribbon through until both ends align, then make a knot near seam opening. All done...time to fill it with your gift! Just for fun, changed out the ribbon to this slightly fancier one with a silver trim. This bag is wide enough for two wine bottles! 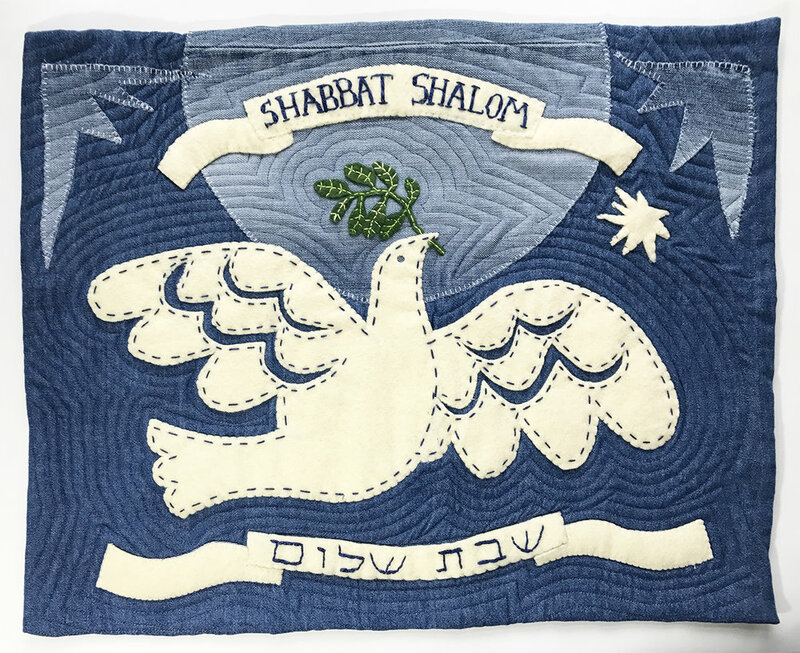 Included in the Peace, Love, Chanukah cut & sew available through Spoonflower, follow the same instructions as listed above to make this one. Disregarding the fact that I need to practice my sewing skills.... this little bag is the perfect size for gelt. Happy Chanukah! I gave my son three etrogs on his 10th birthday. Two for working with, one for savoring it's sweet, subtle scent. The etrog is a medium-sized citrus fruit, with a color, scent and taste similar to a lemon.